I fell in love with Tarot about 30 years ago when I had my first reading. The images really spoke to me and I knew that I wanted to learn how to "read" Tarot. My life was not going that well (to put it mildly) and I thought if I could see into the future, I could somehow be happier or less of a victim. Little did I know that the path I would take would lead me into a spiritual understanding of the Tarot rather than a superficial "fortune-telling" aspect. In the late 70's I moved to Hawaii and joined a spiritual community and met my teacher, Miranda Jacobsen who was a master at the Tarot. I also studied with the Kahuna Mrs. Bery and many others. Slowly slowly slowly slowly, my spiritual path became clear to me and the Tarot was an intrinsic part of that path. Am I a Tarot addict? Probably, although I have never counted the decks I own, but it is probably over 100. 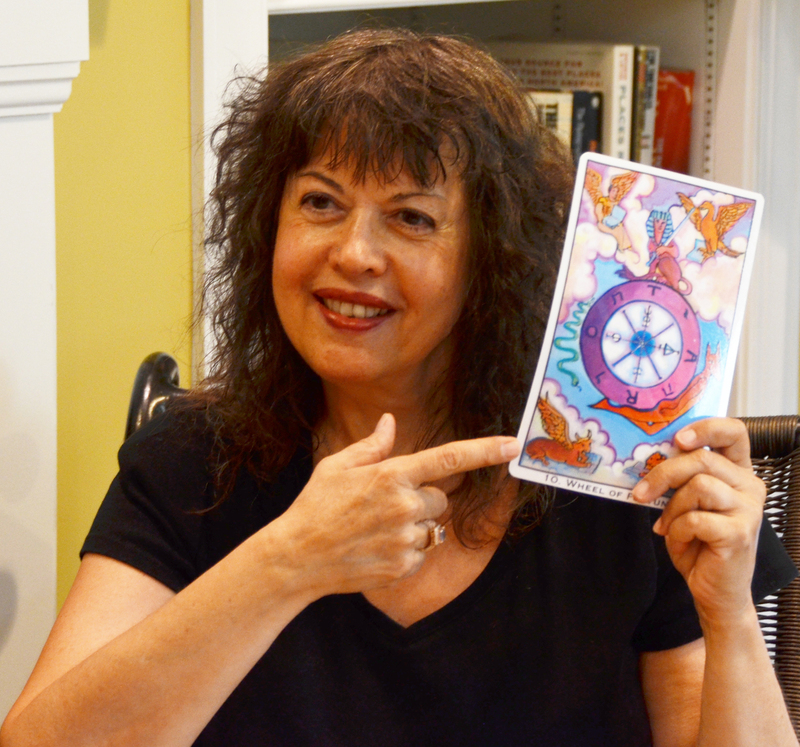 Reverend Geraldine Amaral is the co-author of Tarot Celebrations: Honoring the Inner Voice and creator of a Tarot instructional video, “Tarot 1-2-3.” She has a regular column in Pathways Magazine. She conducts a series of unique and creative tarot classes in the Washington DC area, utilizing Jungian and archetypal psychology. In her classes, she teaches people how to apply the tarot's esoteric principles in pragmatic ways and as a tool for personal transformation. Her uplifting perspectives provide a unique blend of spirituality, psychology, philosophy, humor, literature and personal empowerment methods. She is a well-respected teacher, motivator and spiritual leader. She is an ordained minister in the United Metaphysical Churches. She holds a BA in psychology and an MA in English from Bridgewater State College in Massachusetts and previously taught English at the high school and college level. She resides in Alexandria, VA with her husband and two cats. You can contact her at geraldine@thespiritualtarot.com or visit her website at www.thespiritualtarot.com. 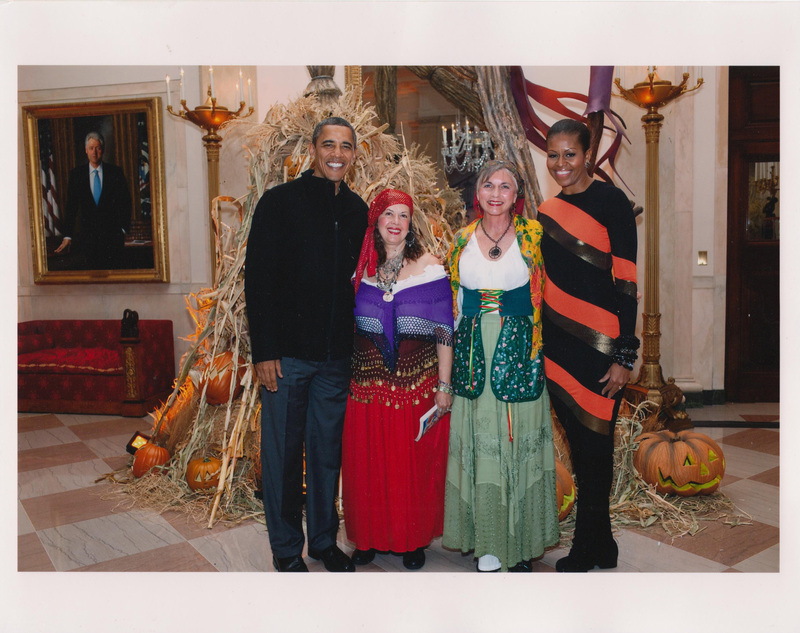 This photo was taken on October 29, 2011 at a private Halloween Party at the White House for White House staff and various military families. This is Geraldine with her friend/colleague Bev Hitchins and we had the honor of having our photo taken with the Obamas. It was an incredible experience! Although neither the President nor Mrs. Obama had readings, they were very warm and down-to-earth and made us feel really welcome.